An EMP – a nuclear electromagnetic pulse is a burst of electromagnetic radiation from a nuclear explosion. A nuclear weapon that is detonated hundreds of kilometers above the earth will produce an EMP which will produce damaging and likely catastrophic current and voltage surges to electrical / electronic equipment and systems. While exploring the possibilities of protecting such equipment from an EMP, I discovered that a nuclear EMP consists of three parts, three components, or three pulses (not just one…). Note: The effects of a high altitude nuclear EMP detonation depend on the altitude of the detonation, its energy yield, gamma ray output, the interactions with the Earth’s magnetic field, and electromagnetic shielding of targets. The E1 pulse is the first of three pulse components of a nuclear EMP, and is very fast. This initial pulse is very short in duration but is a very intense electromagnetic field that induces very high voltages in electrical conductors, semiconductors — ‘solid-state’ electronics, microchips and integrated circuits, etc..
E1 causes most of its damage by causing the ‘electrical breakdown’ voltages of semiconductors to be exceeded. Zapped… Permanently. What causes the E1 pulse? E1 is produced when gamma radiation from the nuclear detonation ionizes (strips electrons from) atoms in the upper atmosphere. The electrons travel in a generally downward direction at nearly the speed of light. The Earth’s magnetic field deflects the electron flow at a right angle to the field, and this interaction produces a very large, but very brief, electromagnetic pulse over the affected area. How fast is the E1 pulse? In case you were wondering, the E1 pulse occurs far too quickly for ordinary surge protectors to be effective. The pulse may rise to its peak value in 5 nanoseconds (0.000000005). To put that in perspective, ‘the blink of an eye’ takes about 300 milliseconds (0.300000000). How strong is the E1 pulse? The E1 pulse near ground level at moderately high latitudes may reach peaks of about 50,000 volts per meter! The strength of the pulse depends upon the number and intensity of the gamma rays, and upon the rapidity of the gamma ray burst. Strength is also somewhat dependent upon altitude. Its magnitude typically decays to half of its peak value within 200 nanoseconds and ends 1000 nanoseconds after it begins. The E2 component has similarities to lightning. What causes the E2 pulse? The E2 component is generated by scattered gamma rays produced by neutrons. How fast is the E2 pulse? E2 lasts from about 1 microsecond after the explosion to 1 second after. So it’s rather slow (comparatively), about 1 second. How strong is the E2 pulse? Apparently substantially less than that of lightning. E2 is generally considered to be the easiest to protect against. It’s mostly irrelevant though because since E2 immediately follows E1, the devices will probably already be ‘toast’. The E3 component is slow. What causes the E3 pulse? It is caused by the nuclear detonation’s temporary distortion of the Earth’s magnetic field and has similarities to a geomagnetic storm caused by a solar flare. How fast is the E3 pulse? E3 lasts from tens of seconds to hundreds of seconds. How strong is the E3 pulse? Like a geomagnetic storm, E3 can produce geomagnetically induced currents in long electrical conductors, damaging components such as power line transformers (although a geomagnetic storm, or ‘Solar EMP’ does not have an E1 or E2 component). Interestingly, a nuclear weapon designed to be used as an EMP weapon (smaller, simple and efficient) is generally poor at producing an effective E3. Whereas thermonuclear weapons (hydrogen bombs) are very inefficient at generating the fast-rise-time E1 pulse, they are much better at generating the slower geomagnetic-storm-like E3 pulse – which induce large currents in long electrical lines. The E1 pulse of a nuclear EMP weapon is what will do the most damage. While it is relatively easy to protect against E2 and E3 (‘easy’ is a relative term), it is quite difficult (or impossible) to effectively protect against E1 for functioning electrical systems. I had researched and discovered the information above while deciding how best to protect my PV solar panel system from EMP. To that end, I have inserted what I expect to be adequate protection for E2, while E3 should not be an issue. E1 however is THE problem. Even the best and fastest surge protectors that I have installed will not clamp down quickly enough to stop the potential damage from E1. Therefore the issue does not become one of protection (of the functioning system), but one of ‘backup’ components…in a Faraday Cage (e.g. a Faraday constructed ‘shed’). A little off topic, but there is a website Nuclear Emergency Tracking Center that shows real time status of the U.S. nuclear situation. For instance there is a landfill in MO. with nuclear waste buried, and it shows the current threat levels. Too bad it doesn’t show real time Fukushima radiation in sea food !!! Ken, thank you for posting this topic. It is one that I think is very relevant as far as real risk is concerned. Also as we are upgrading our own system, I was wondering like you mentioned in the post that, really the E1 would likely fry any installed solar system within range. So having a back-up…can you share generally what type (materials) of faraday shed you constructed for your back up system? Would a small backup system unconnected in an underground basement still be affected? @Shepherdess, I plan to build a ‘Faraday Shed’ this Spring – and will be posting on it during that time. With that said, I currently use a few metal trash cans with secure lids to store various electronicals (although not big enough for spare solar panels!). Regarding the Conex (storage container); that’s exactly what I have as a Faraday Cage. Was simple to get 10 sheets of 1/8” steel plating and weld (full weld) it to the floor over the existing wood floor and lay insulation. Now ya have a 40’X8’X9’ (High Cube Conex) Faraday Cage that will hold a LOT of “stuff”, even that extra set of grandmas dishes hehehehe. The biggest problem is the doors, but a flexible mesh around the edges takes care of that. The cost is cheaper that a New Shed since you already have the Conex unless it’s already full. Excellent information Ken, you’ve done your homework. 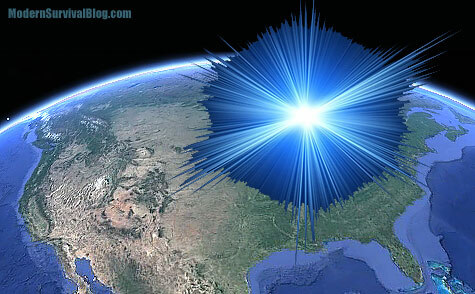 To me the scary part of an EMP or Grid Down situation is that so many have no clue what the true ramifications will be. We have discussed this before, but the instantaneous ramifications are mind boggling. Just imagine everything coming to an instant and permanent stop. Everything (99.999%) is supported by Electricity in one way or another; it touches us in every part of our “modern” lives. I’m sure that most of us have read One Second After, and Ted Kopple’s book Lights Out among many others that deal with Grid Down situations. And I know a lot of us have prepared for this happening, all 2-3% Maybe? One of the main problems is anything and I do mean anything/everything connected to the grid, exposed to the atmosphere, or not totally enclosed in a Faraday Cage WILL be worthless, except as a Boat Anchor (clarification; all electronically controlled/associated “stuff”). With that said, if you want “power” after an EMP, you will have to have backups to ALL equipment involved, Generators, Solar-Panels/Inverters/Controllers/So-On. Than all of your other equipment may or may not work anyways if you do manage to get power up, anything with a “chip” will be goners/toast/Boat-Anchor. So, what’s the answer? A non-electronical lifestyle may be the only thing left. People have lived without a “Smart Phone” for thousands of years, heck even until the last 150 years there was very little “power” out there. I’m not saying live without electricity, I’m saying learn how to live “without” if needed. FYI, there is a lot of Hardened “stuff” around, mostly military and .gov, they have unlimited money after all, SO; be prepared to live without electricity for a long long time IF we get hit by some radical group, ISIS, NK, someone that really don’t like us so much. “5 nanoseconds (0.000000005)” that’s not much time to think about that last bit of preps now is it? Just consider how much generational living wisdom and hands-on skills we traded for convenience. Yep, as much as you can learn to live sustainably and naturally. I got the book 77 Days in September, did anyone like it or think it was a good read? I have read 77, would recommend it, go ahead and get “Daunting Days of Winter” while you’re at it. Also did the “Survivalist Series” by Bradley, Dr. Arthur T. Not an EMP, but Pandemic. I was looking for new books to read, I’ll get both books you mentioned NRP. And as to EMP or Solar Flares, I keep adding items to faraday cage I know will get fried unless protected. The items I add are those that can & will help assist me in dark days after words..
“Lights Out” by Dave Crawford I liked a little more than Ted Koppel’s, Dave’s was a novel, Koppel’s is more of a factually statement. I have 77 days and thought that it was a pretty good book. Lights Out is also a good one. I just ordered the Daunting Days book. I have a small solar set up. Something a shirt tail relative put together for me. I would like to update it but the relative doesn’t live close and have not run across anyone local that can point me on what to do. I’m not sure that if put away extra panels and an inverter would they or should they be okay? I read “77 Days in September” & “Daunting Days of Winter”, I liked both of them. The series put out by Dr. Bradley is enjoyable, but I also enjoyed “Lucifer’s Hammer” which is a good book to read. The best/final solution to an EMP attack from your enemy seems to always be overlooked. Simply, blow his brains out before he blows you away. Done! Problem solved. Oh, I am sorry that is not politically correct. Well that’s defiantly one approach, A second would be the good old “Kill them all, let God sort them out”. If I have a radio, cell phone, etc with no charge, will the EMP affect it? electrical equipment when we ponder the how and what. The circle of devastation will be almost worldwide this time around. I have caught myself in this same mode of thinking, more likely would should be preparing for a complete loss of electronic items except for those that were in our control. I think there could be a few, who could/would band together and build from scratch small generators and transformers for whatever reasons needed at the local level. These would be the kind of skills Ken often talks about here. Once very small machine shops can do milling, turning centers, and maybe a bit of arc wielding, small steps will grow from there. Knowledge will not really be fried to oblivion! But I would hope the “youngsters” will learn these skills in time!!! Ken, with your extensive research on this subject, I will offer some things I was told by a man who should know what he is talking about. This person (a for real retired “rocket scientist” who formulated and solved the mathematical equations for the early Apollo missions and spent his later years teaching mathematics and physics at the local university), and I had a conversation that turned to EMP’s and protection from their effects. I asked if my metal shop building would offer any protection for my vehicles and other equipment Kept inside. His response was that EMP’s would only penetrate inside the building the square of the size of openings (gaps) in the shell. In other words, an opening of 3 inches would mean the pulse would penetrate the enclosure 9 inches, 12 inches- 144 inches, and so on. Any electronics farther than the square of the closest gap in covering metal would be protected. I mentioned that the radio technicians who worked on and repaired the communications equipment for my former department, did so in in a Faraday cage made of copper screen wire, he replied that it worked for the same reason, any electronics farther away than the square of each individual small opening between the strands of copper wire would be protected. This seems to conflict with a lot of the information I’ve seen on the internet on this subject. Have you any information from sources with a background such as this man that would prove his advice to be faulty? A Faraday Cage may be constructed from materials such as an aluminum ‘screen’ mesh, or a copper mesh (better than aluminum) or solid conductive material (the best). If using mesh, the size of the openings in the mesh determines a so called ‘cutoff frequency’. Below this frequency, any signal that may enter will exponentially decay as it propagates through the structure (attenuation). I bought 3 “EMP PROOF” shortwave radios at the local hamfest 2 weeks ago. For those that may not know these are the old tube type radios. While I do not believe they are totally EMP Proof they will suffer less damage and I have a lot of parts to repair them. I have repaired electronic equipment that has taken a lightning hit (E2)and know how much damage can be done. An EMP could be worse especially for surface mount electronic components. Ken — Great article, thank you for bringing attention to this incredibly important topic! Remember that the most vulnerable diodes/transistors / etc are those which are at the FRONT END of any electronic device, that has an attached antenna of significant length (to absorb energy). Also, remember that diodes in the FORWARD direction may do fine. Internal diodes (which receive only minute fractions of the energy that is dissipated by the “shell” of electronics outside them in the design) may be unaffected. Many current ham radio designs have back-to-back diodes in the front end specifically to protect the receiver. On both phases of an incoming wave, one of the diodes is conducting (0.7 VDC) and such systems may harmlessly dissipate an EMP— they routinely protect the receiver from the CONNECTED transmitter output! I’m not claiming all will survive, but this is a preferred EMP protection strategy for solid state systems. Transmitters require different solution. Google my “handle” for articles giving more details. Vacuum tube equipment actually tested in the 1980’s did fine. That is an incredibly important piece of factual information to remember. Ken Well stated, EMP should be realized as the number one threat to our Nation any potential threat that we face is going to kill a large number of people at the onset or as a ongoing reset to our current way of living. I recently even bought several DG steritemp rectal thermometers (handheld oldstyle mercury type) when I realized the newer electronic ones would be at risk to EMP. I worked for the company that invented the transistor and observed on a daily basis for about 20 years what even static electrical discharge can do to electrical componets or equipment…….bottom line they are fragile always. we live on the edge in a society that worships the latest and greatest “advancements” but fail to see the tradeoff in the cost of those advancements by the ever increasing size that a diaster would extract. We have created a nuclear planet and the potential for failure continues to grow. I don’t agree that metal oxide varistors (surge protectors) will be completely unable to protect against E1 component. Testing in the 1980’s revealed that all the vacuum tube ham radios survived. (Reported in QST, done by the government, google it). There were indeed some surge protectors that didn’t have fast enough rise time, but others worked adequately. Gas discharge surge arrestors are used widely to protect radio circuits that can’t stand the capacitance of the MOV types. Filtering is another solution. The spectral composition of E1 is discussed in many publications, primary energy is below 100 MHz. Systems that filter out most frquencies (essentially a Faraday system filters out ALL frequencies) will have less difficulty surviving. With E field of 5-25 kV/m, small protected devices (emphasis on protected) that are not connected to large antenna or equivalent will experience voltages that are well within the static electricity voltages they routinely protect against. Modern ESD (electrostatic discharge) devices are in many many consumer objects today. Forward diode protection is included in many many ham radio receiver systems today and should provideadequate protection especially where some filtering is part of the design. There are ways to keep things working. Takes good design. Buy vacuum tube radios….they work. I’m not as worried about our radios surviving as I am my brother’s pacemaker. Does anyone know if those will survive EMP? My thanks. I would imagine a pacemaker would be adversely affected. I recently read up a bit on pacemakers (for a friend), and came to the site of a company which makes them. Sorry, but from what I hear/read…..
Hi — great question on pacemakers and E1 EMP. I’m not sure that anyone knows the answer for sure, but let me point out some of the issues. 1. The pacemaker has maybe 1/4 meter worth of wiring between it and the heart suggesting that it may at most receive 5-10kV jolt out of a 25kV field. 2. While indeed at my hospital pacemakers HAVE been fried by surgeons using electrocautery (“Bovie”) — more modern pacemakers include extensive filtering/surge protection and it has been many years since I’ve heard of this happening. Furthermore remember the human being is full of electrolyte solutions — seawater if you will — and in essence “shorts out” some of the incident radio wave. A rather imperfect “Faraday” shield, but SOME shielding. Yes, you should stay away from intense RF fields, but have you ever heard of a pacemaker patient dying because they drove beside a radio antenna or cell phone substation? Nope. So the jury is still somewhat out on this topic but there is some cause for hope. Especially if the wearer is inside any metallic structure that limits the field they actually experience…. I read the article , and most of the comments . I have a theory which , if wrong please let me know . In a EMP event , it seems the first wave , the most dangerous to electronics would be absorbed by sub stations and transformers . That would cut off electric current to your house ? So , would appliances like freezers and refrigerators be some what protected or would they be knocked out as well ? If so does that mean you would need a back up refrigerator , or have a refrigerator in a faraday cage ? AGain, I am not sure this has been tested. Modern refrigerators have lots of vulnerable components — but they also have better protection than ever before. A new dishwasher that I esamined had both MOV and gas discharge protection on the incoming AC line….not sure if the “thermostat” line is protected however in a fridge…. Remember the metallic outer shell of a refrigerator may provide some imperfect protection — certainly not 80 dB worth, but some protection. I just don’t think the answer is known. I would be prepared to replace the complicated electronics with a simple bimetallic thermostat / relay if you really want to be cooling after an EMP…..of course you’ll have to provide your own Electricity then! The control computers of power stations may well be fried by the E1, and the massive interconnection transformers may have been cooked by the longer-lasting E3 waves…. Protection of the grid against E3 could have been implmeneted for a pittance of the national budget….but it is stalled. One state however has taken action to protect their grid to some degree and may provide an example for others…. here’s hoping! I appreciate the information. You are right most of the effects from an EMP attack are conditional and theoretical. I have read one second after it is a good book. Also I realize , I need more knowledge on refrigerators , but does MOV stand for ? Many thanks to Ken for bringing well-researched attention to this important topic. If you would like to be better prepared for this event, I would strongly suggest reading widely on this risk, developing some electronics knowledge, and implementing combinations of MOV / gas discharge arrestor techniques on crucial equipment at your house, and providing for EMP-resistant alternate power for your house….not to mention the ability to survive the deadly chaos that would erupt in our society (Read “One Second After” for example)…..many people have given serious thought to surviving this attack and there are many who will survive and thrive. Question: How much time do we have to put our things in a faraday cage when the EMP happens? Please note; “The pulse of an E-1 may rise to its peak value in 5 nanoseconds (0.000000005)”. Ok so not Zero, but 0.000000005 of a second. That’s not much time to react. So does that mean that we should keep things in the protective cage all the time? Cause you never know when it will happen. then you can’t use the items at all. then why have the protection? Yeppers, that’s exactly what that means, BUT 99% of what you would probably store in a Cage are things you would have “seconds” of or really only need after an EMP fries everything else. IE. Secondary HAM Radio. It’s about the world after the power grid is trashed. Warning though. It is pretty scary. As an electronic tech since 1958 I have seen and worked on tube type and early transistor equipment up to todays microchip world . I hold Gov. license in radio first class with radar. After fifty nine years in the electrical and electronics field there is so much misinformation on how to shield your goodies from an E1 pulse . First its easiest to say what does not need shielding . A motor or compressor with no electronic controls except an on off switch .If it has a speed control the control is blown out . AN old style Edison light bulb — most toasters — steam iron — hair curler — 12 volt car battery AA — AAA –C –D batteries That’s about it , now your getting the idea !!!!!!! What needs protection nearly all rechargeable batteries like the 18-650 battery –charger– power source —drills— plugin batteries for all tools ..Anything electronic —LED flash light — LED lamp bulbs — compact florescent — your digital volt meter ETC. Calculators –radios –TV’s –computers –printers — your mother-in-law , you get the idea. NOW how to shield and self test your shielding ..Sticking a transistor radio in a micro or trash can or placing your cell phone in and calling it is a poor if not useless test. An E1 burst is a million times more powerfull. .And in a file cabinet or refrigerator is useless . An inexpensive test is to use two 400 plus meg HZ. walkie talkies , Place one in what you would like to test ,in the on position and with the other one key the call tone button . If you here it beep your shield is not good . What makes a good shield —-aluminum foil ,three layers or more. all edges must overlap and be folded tight. in most cases pre wrap item first in a paper ,baggie , rag , bubble wrap so it does not touch the foil. . A new steel garbage can with no dents on the rime or lid is poor but better than nothing , Metal ammo boxes do not work as they are, they must be modified . the lid may be air tight but will not block an EMP . Out of all comments I have read, I believe you would be the only person I would trust with a reply to my question. What is the best way, if at all, to protect a large floor safe with an electronic lock from an emp? Would a pacemaker be affected by EMP’s? Dorlis, No one knows for sure (because we haven’t experienced a weaponized EMP). That said, I would suggest ‘yes’.